Ray Rist, a sociologist, found that social class contributed to the perceptions of teachers and was a predictor of scholastic success. In 1970, Ray Rist published a study on the relationship between the socioeconomic status of children and their educational evaluation. In his study, Rist observed how a classroom teacher placed her students in three learning groups. The “fast learners” were grouped at the front of the class, while the “slow learners” sat at the back. Interestingly, Rist noticed that social class was a predictor of placement. Middle class students made up the group of “fast learners,” while lower class students made up the other two groups. From his data, Rist concluded that each child’s journey through school was determined by the eighth day of kindergarten. The labels given to these children by their kindergarten teacher set them on a course of action that could possibly affect the rest of their lives. Ray Ristwas a sociologist who, in 1970, published a report linking the socioeconomic status of children to their educational achievement. Through observations of classrooms, Rist demonstrated that a student’s socioeconomic status affected how teachers perceived that student’s aptitude at very early ages. These early perceptions came to inform how the students viewed themselves, and had impacts on their eventual educational success. Although public schools are free and open to all children, there are still educational setbacks for children of a lower social class. In his 1970 article, “Student Social Class and Teachers’ Expectations: The Self-Fulfilling Prophecy of Ghetto Education,“ Ray Rist observed an African American classroom with an African American teacher. He discovered that after only eight days in the classroom, the teacher felt that she knew her students’ abilities well enough to assign them to separate worktables. To Table One, she assigned those she considered “fast learners.” These students sat at the front of the class, closest to her. “Average” students were placed at Table Two, and the “slow learners” were placed at Table Three in the back of the classroom. Interestingly, Rist found that social class was the underlying basis for assigning the children to the different tables. Middle class students were placed at Table One, while children from poorer homes were placed at the other two tables. During class, the teacher paid the most attention to the children closest to her, less to Table Two, and least to Table Three. As the year went on, the children at Table One perceived that they were treated better and started viewing themselves as smarter than their peers. They emerged as leaders in class activities and even ridiculed the children at the other tables, calling them “dumb.” Eventually, the children at Table Three stopped participating in classroom activities. By the end of the year, the only children who were satisfactorily completing the daily lessons were those at Table One. Following the initial year, Rist continued to observe this group of students as they advanced in school. The children’s reputations followed them into second grade, where another teacher reviewed their scores and also divided her class into three groups, the “Tigers,” “Cardinals,” and “Clowns.” These groups were constituted the exact same way, and with the exact same breakdown, as Tables One, Two, and Three. From this research, Rist made the startling conclusion that each child’s journey through school was determined by the eighth day of kindergarten. According to Rist, the labels given to children by their kindergarten teachers set them on a course of action that could possibly affect the rest of their lives. 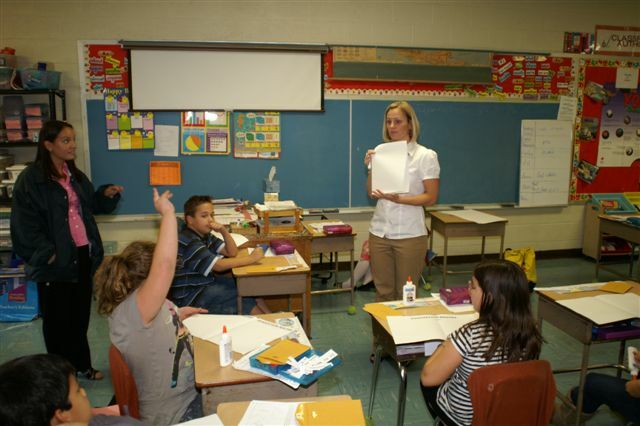 Students with teacher: Rist’s research showed that teachers judge their students’ abilities after only eight days in the classroom.